The World's No.1 PU Suer grip was introduced over 21 years ago. 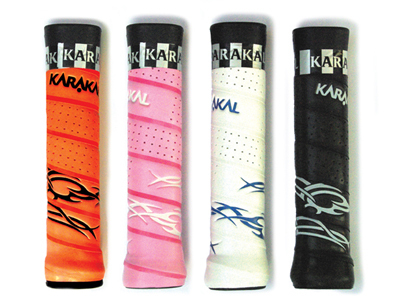 The Tribal Grip has a 'traction' embossed improved PU surface the KARAKAL PU Super Grip remains the No.1 PU Grip for all racket sport players with improved durability, gripping power and comfort. Key Features: Traction Embossed Surface Non Slip NST PU Surface Super Absorbent Super Tacky Extra Thick Self Adhesive Universal Length Extra long life Available in Black, White & Orange. NOTE: WE CANNOT GUARANTEE COLOR CHOICE ON THIS ITEM. IF YOUR COLOR IS OUT OF STOCK, WE WILL SUBSTITUTE WITH ANOTHER COLOR.